CarMax, Constellation Brands, and PriceSmart stocks could make big moves over the next few trading days. Stocks ticked higher last week, with the Dow Jones Industrial Average (DJINDICES:^DJI) rising by less than 0.5% as the broader S&P 500 (SNPINDEX:^GSPC) gained almost 1%. 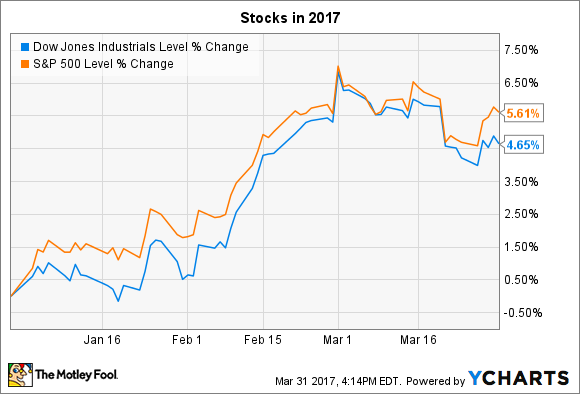 The two indexes are up roughly 5% and 6% so far in 2017, respectively. A few highly anticipated earnings announcements this week could produce volatility for shareholders of CarMax (NYSE:KMX), PriceSmart (NASDAQ:PSMT), and Constellation Brands (NYSE:STZ). Let's look at what investors can expect from these companies as they post their operating results in the days ahead. CarMax will announce its fiscal fourth-quarter results on Thursday, and investors are cautiously optimistic heading into the report. Shares have risen 20% in the past year but remain significantly below the all-time high set in mid-2015. One of the key reasons for the rising optimism is the fact that customer traffic rose last quarter after several consecutive quarters of declines. CarMax chose to use that down time to focus on improving its conversion metrics -- and to great effect. The combination of a slight traffic uptick and more efficiency in turning shoppers into buyers produced a 5% jump in comparable-store sales in the most recent quarter. Investors will be watching for continued momentum on this comps metric, along with healthy average selling prices and profit margins. In addition, the auto retailer will likely provide details on its plan to expand its sales footprint into at least three new markets in fiscal 2018. Alcoholic beverage giant Constellation Brands is set to post its fiscal fourth-quarter results before the market opens on Thursday. Business has been booming lately thanks to surging demand for its portfolio of premium beer brands, including Corona, Modelo, and Pacifico. These products helped the segment soar 16% last quarter as the company snatched up market share. Rising average prices, meanwhile, contributed to a 40% spike in net income while profitability improved to 29.5% from 27.3% a year ago. Constellation Brands expects to close out its fiscal year with beer sales growth of between 16% and 17%. Earnings are projected to come in at $6.60 per share at the midpoint of guidance, for a 22% jump over the prior year. Future gains will require significant volume growth, which explains why the company is aggressively spending to expand its production capabilities. Investors can also expect to see the company continue making big acquisitions to bulk up its portfolio and add scale to the business. International warehouse club PriceSmart is finally growing again now that brutal currency devaluation trends have lightened up in the core Colombian market. Comps were flat last quarter, but overall revenue rose 4% thanks to stabilization in the business there. "We have seen an improving sales picture in all of our warehouse clubs" in Colombia, executives explained in the 10-Q report. The operating trends have brightened since then. PriceSmart posted a slight increase in comps for the month of January and a 2.6% boost in February. The retailer also acquired space for a new warehouse in Costa Rica that will bring its total presence in that country to seven when the club opens later this year. With Colombia sales trends on the mend, CEO Jose Luis Laparte and his team will likely allow prices to slowly rise in that country, which suggests solid earnings growth ahead. Executives have to balance that goal against collecting robust membership gains, though. That's why investors will be focused on both comps and the key subscriber metrics of renewal rates and membership income on Thursday.